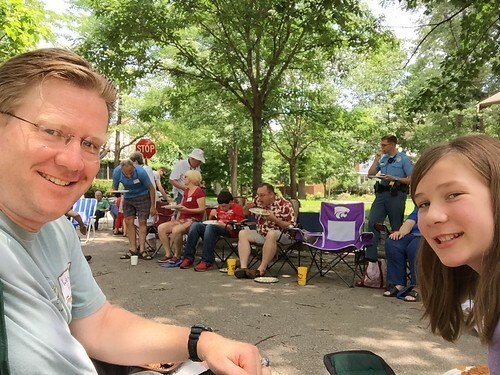 Today Rachel and I have been in Manhattan, Kansas, visiting my parents, and we participated in their annual neighborhood picnic. 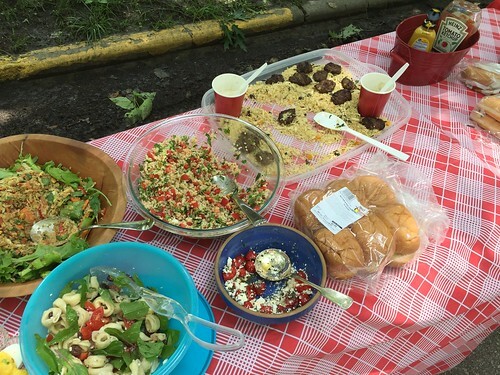 It’s officially “Manhattan Day,” since it’s the first Saturday in June, and neighborhoods around the city are encouraged to get together and celebrate with potluck picnics. 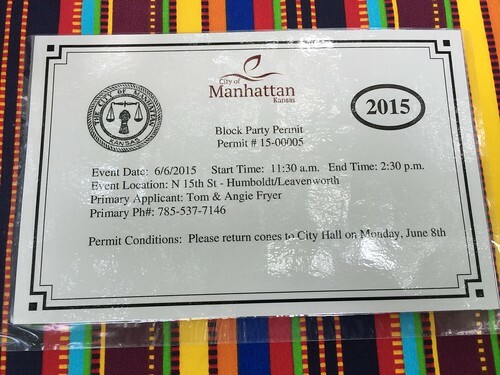 The City of Manhattan supports these events by granting free permits to block off portions of streets for gatherings, and local Dillons Supermarkets donate free hot dogs and buns! In January 2015, the Riley County Policy Department (which serves Manhattan, as well as other northeast Kansas communities) officially adopted and started supporting NextDoor.com. 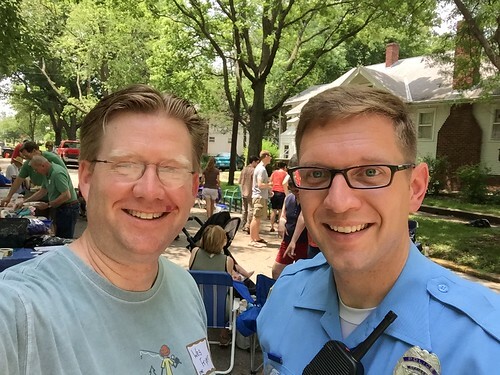 Today at the picnic I interviewed officer Matthew Droge about NextDoor and why it’s better than the traditional “neighborhood watch” groups which have been used in the past to support local crime prevention. The video is 3 minutes long. After we recorded the video, I asked Officer Droge about how the Riley County Police Department‘s use of Twitter (@RileyCountyPD) has evolved and changed over the years. He said the first year (I think 2010) someone had created an account and tweeted six times about construction on K-18, one of the local highways that connects Manhattan to Interstate 70. Then the account was dormant until a conversation started about how their department could better communicate with college students at Kansas State… especially after midnight when traditional media outlets are closed. Most K-State students don’t listen to KMAN (the main local AM news radio station) or subscribe to the printed version of the Manhattan Mercury newspaper. Many local students are, however, using Twitter. There are now almost 10,000 Twitter users following @rileycountypd. Initially, Officer Droge said, they had about 12 different people in the police department tweeting on the account. Now, they have only three people tweeting to the account, with defined responsibilities, and he handles all the replies. Many different organizations, including schools and school districts, can learn a great deal from the progressive way the Riley County Police Department has embraced and is using Twitter. The following Twitter exchange yesterday with a local radio station, immediately clarifying allegations of a violent situation, is an excellent example of how Riley County PD is able to effectively leverage social media to communicate accurately and in a timely way with the Manhattan community. @1015krock This is absolutely untrue. There was no active violence and the public was not in danger. The way the Riley County Police Department is using both YouTube and Twitter (as well as Facebook) to directly communicate with members of the community (like the tweet below, also from yesterday) is also exemplary. This reminds me of the regular YouTube video updates the National Weather Service in Norman, Oklahoma, posts to Twitter (@nwsnorman) during severe weather times. In our current political and societal climate, when we hear and see so many negative things about local police forces, it’s wonderful to experience the positive ways Riley County Police officers are supporting and interacting with members of the Manhattan community. 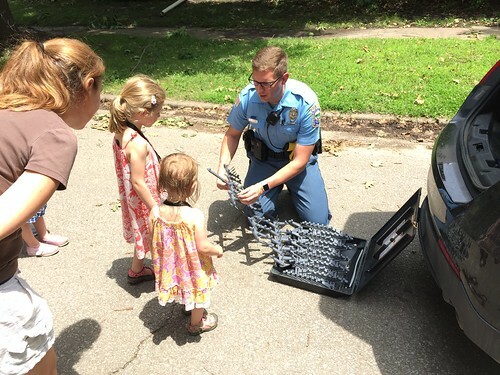 Thank you Officer Droge and Nextdoor.com for helping bring together members of my parents neighborhood for an awesome picnic today, and modeling how strong, positive community relationships can be build and maintained between citizens and their police officers! 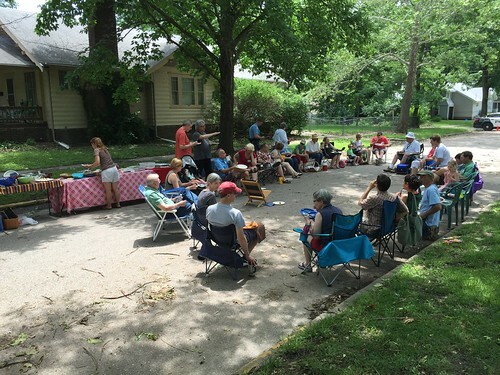 Check out more photos from today’s picnic in this Flickr set. I did not know the “Next Door” app was so useful. I only knew that I was a good tool to report break ins to neighbors. I was unaware that you can find a useful babysitter by using this app. Nor was I aware that you can notify neighbors about a lost dog. I find that by your post that this app can be very useful and I will see if the app is available in my neighborhood.